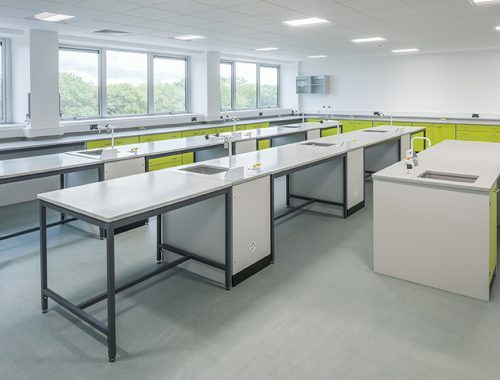 Science laboratories should be inspirational spaces, accommodating practical experiments, interactive teaching, group discussion and individual research. 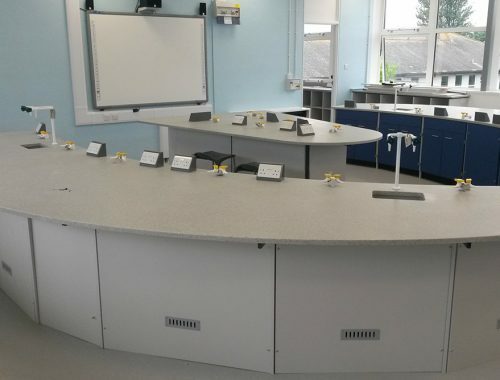 Klick Technology specialise in designing laboratories for schools & colleges and have over 35 years’ experience in this field. Our experienced design team listen carefully to your brief and offer practical advice to make the most of your budget. As part of this free service we provide 3D CAD layouts for all quotations to aid visualisation of the room before making a final decision. 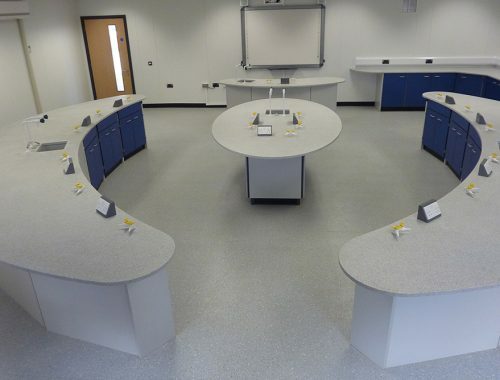 Our project management team can co-ordinate the supply & installation of your science furniture or offer a full turnkey refurbishment service. We provide a one-stop-shop solution which includes the co-ordination of all trades – an invaluable service for busy school staff. 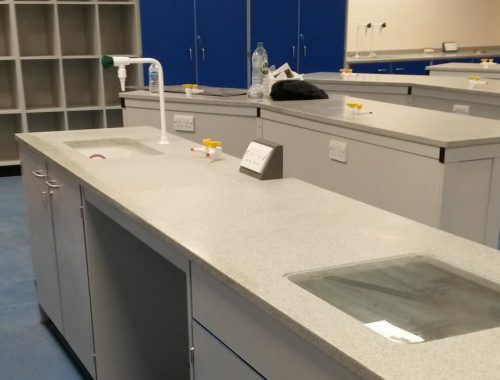 Laboratory design involves the integration of surfaces, services and storage facilities to suit specific teaching requirements and preferences. Klick offer several different systems to allow a choice of layout styles and make the most of your available space. 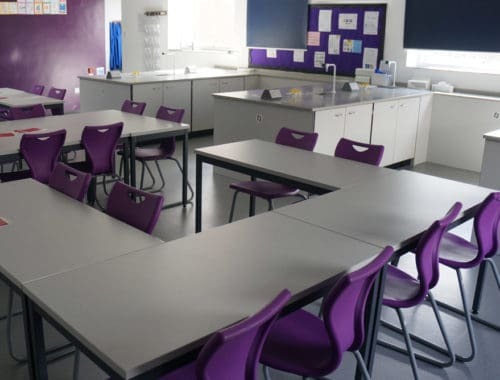 Our designers take into account budget restraints, current Health & Safety legislation, curriculum requirements and, where necessary, existing facilities. At Klick we enjoy a storage challenge and consider storage facilities in the science laboratory to be key. 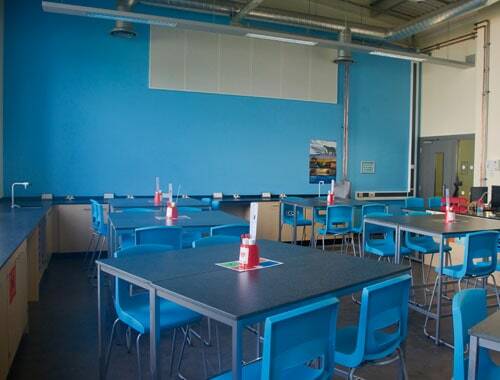 An uncluttered environment allows students to concentrate safely on their studies and limits distractions. 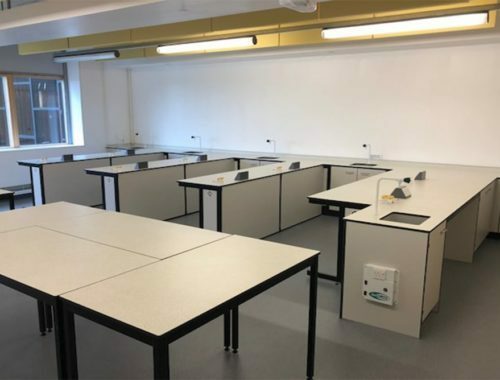 Science laboratories usually include a combination of secure cupboards and trays to allow for the storage of chemicals and equipment. It is preferable for bags and coats to be stored in units away from the practical area. 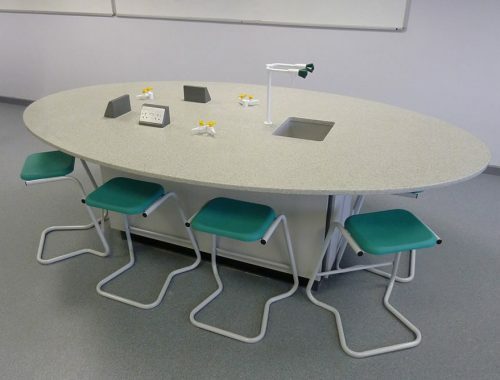 Science laboratory furniture for schools needs to be extremely durable, functional and cost effective. 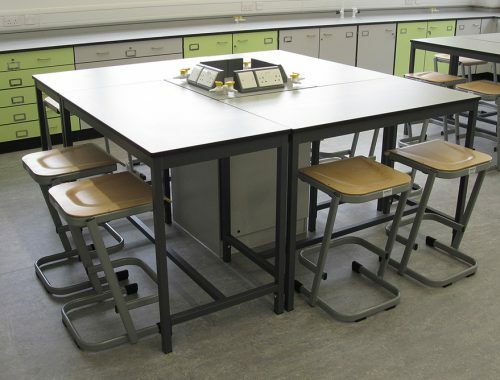 Our laboratory furniture is made in the UK and designed to meet the demands of a busy school lab. Chemical and physical resistance comes from using the appropriate work bench material. 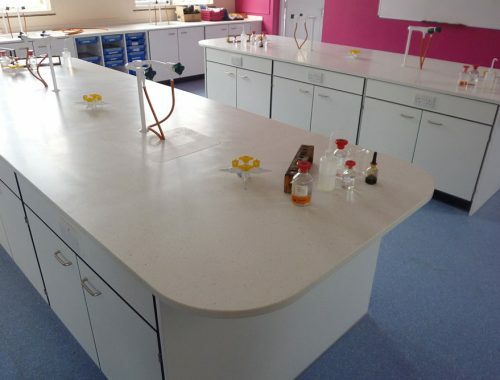 Klick offer a number of science lab bench worktop options including Velstone, Trespa, Iroko and Corian. We offer a quality product, competitively priced to suit your budget. 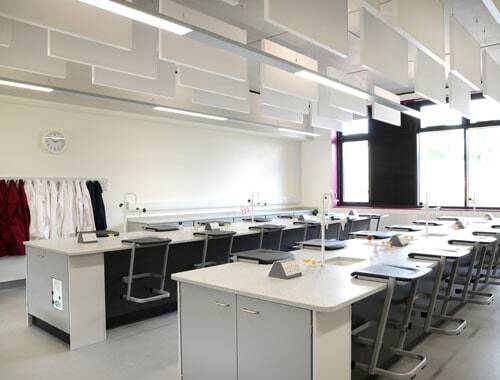 Teaching walls have become an invaluable resource making good use of underutilised space at the front of the science laboratory. Interactive whiteboards can be integrated into modular storage units which are easily accessible for teaching staff and provide a good focal point for students. 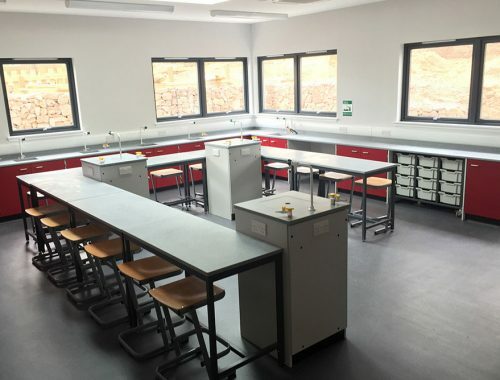 The design of the school prep room is critical to the smooth running of the science department. Our designers can advise on the specification of sinks, shelving and storage. We also discuss the relevant fume cupboard requirements for your project and can provide any ancillary building works necessary for fixed fume cupboard ducting. Browse our latest Science Case Studies using the arrows below or click to view all case studies. 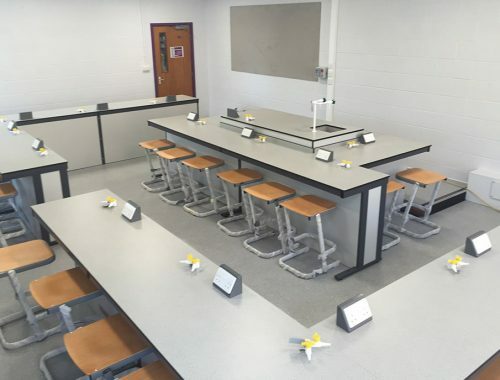 Add a teaching wall to de-clutter your lab!